This paper describes policy options for improving security of tenure for private renters. The Renting Homes Bill and the 2016 Assembly election manifestos are opportunities to secure improvements to current law, with a view to tackling poor conditions and creating a more desirable housing sector for the growing population of private renters in Wales. This briefing has been produced to provide additional policy detail on the first recommendation of our Make Renting Right campaign. Support for a Tenants Union – so that tenants can be adequately consulted by Government about changes that affect them. AMs are already well aware of the changing demographic profile of private renters and the fact that the sector is increasingly being seen as a long-term housing option for households who in the past would have been more likely to be able to access social housing or acquire a mortgage. Households with children now make up a third of tenant households in the PRS. Today there are around 112,000 children living in privately rented housing in Wales. Our 2015 YouGov survey of private renters, carried out in partnership with British Gas, found that 86 per cent of Welsh renters wanted to be able to stay in their home for as long as they need to. More than four in five (81 per cent) agreed that being able to stay in their home for as long as they needed would improve private renting for them. But to date the market has not been able to provide the security that most renters need. This is due to an imbalance of supply and demand. Most landlords have no difficulty sourcing new tenants – the average void time in Wales is only 3.4 weeks. This means that there is little incentive to offer longer fixed terms in order to guarantee income into the future. As a result, landlords are able to prioritise the flexibility of easy access to ‘no fault’ eviction powers. My tenant entered into a 6 month Assured Shorthold Tenancy, this is about to run out. Should I enter into a further 6 month agreement? NO – in almost all cases it is better to allow the tenancy to become a Statutory Periodic Tenancy, this happens by default if you do not enter into a further agreement. The advantage is that you can, at any time serve a Section 21 Notice. This is a real advantage for a landlord, should a tenant become difficult. Insecurity of tenure is closely linked to poor conditions. Our casework experience shows that tenants often move home to escape poor conditions because they know that if they try to take their landlord on, it is a battle they will ultimately lose due to their lack of security of tenure. The Welsh Government has already acknowledged this by proposing to include protection from ‘retaliatory’ or ‘revenge’ eviction in the Renting Homes Bill. We welcome this move but we also know that the protection will not be failsafe – it depends entirely on how confident tenants are to exercise their rights in court. Improved security of tenure would mean that retaliatory eviction protection would no longer be necessary. Because the market is not delivering on its own, we need to regulate in order to create secure, long-term tenancies. Doing so will encourage tenants to see a home as ‘theirs’ and care for it accordingly. It will give them greater confidence to stand up for their own rights, and work with their landlords to improve the state of their housing. Can the sector cope with change? The majority of landlords in Wales and Scotland say that their business would be unaffected by greater security of tenure. A YouGov survey of landlords carried out by our sister organisation Shelter in 2015 found that 56 per cent of Scottish and Welsh landlords said they would not change the location or number of homes they let out if longer term contracts became the default tenancy type, with a further 31 per cent undecided. Of those landlords who had an opinion on the question, four out of five (80 per cent) said their investment would be unchanged. 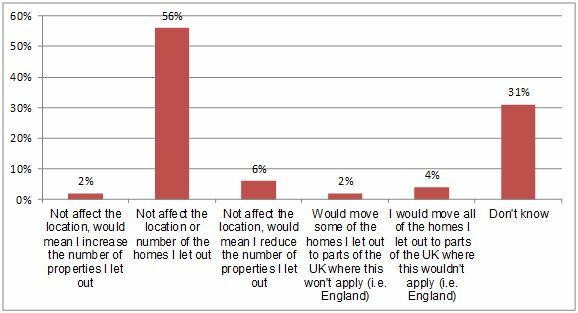 These stark findings undermine the often-cited opinion that most landlords would leave Wales if tenancies became more secure. • Relatively simple approach; potentially more palatable to landlords as ‘no fault’ eviction power still retained. • Fairly complex but does give tenants greater control over their own situation. We know that the Welsh Government wants to improve the private rented sector. The Housing (Wales) Act 2014 and the Renting Homes Bill both aim to improve conditions, but this can only be achieved if there are stronger rights for tenants. Local authorities don’t have the resources to carry out enough enforcement. In the last eight years, Welsh authorities have only prosecuted an average of one landlord per authority, per year. Improving poor housing conditions in these austerity-driven times isn’t easy but it’s vital if we are going to improve people’s health and wellbeing. Empowering tenants to stand up for their own rights, and to work with their landlord to improve the state of their housing, is the only sensible thing to do. For more information on any of these proposals contact Jennie Bibbings, Campaigns Manager at jennieb@sheltercymru.org.uk or phone (029) 2055 6903. All figures, unless otherwise stated, are from YouGov Plc. Total sample size was 377 private tenants. Fieldwork was undertaken between 22nd June – 13th July 2015. The survey was carried out online. All figures, unless otherwise stated, are from YouGov Plc. Total sample size was 1,071 landlords. Fieldwork was undertaken between 24th June – 14th July 2015. The survey was carried out online. Responses for Wales and Scotland have been combined due to small sample sizes.